I just wasted 30 minutes of my life on a remote training session before I politely informed them that I was getting nothing from the call, and disconnected. They were using a desk phone instead of a proper conference phone, all talking at once (half of them contractors with heavy Indian accents) and in the rare moments when the speech would have been otherwise legible, it was mostly drowned out by the sound of shuffling and typing. Wait... did she just hang up on me or put me on hold? That sounded an awful lot like a receiver being dropped back into its cradle. When they finally called me back, they simply dialled me up from another speaker phone with no acknowledgement or salutation. My phone rang and when I answered it I found myself listening to a bunch of people in mid-conversation over a noisy background. In spite of repeated requests from me, they would not share the desktop with me on the new computer, so I was getting very limited benefit from the call. "Okay, so why doesn't this formula look like that one?" I don't know about them, but I value my time more than that (I could have been doing something useful like bitching to LJ about it) so I asked them to send me the crib notes from the meeting later and hung up. This Father Christmas might not look that creepy in isolation, but imagine a whole bunch of lined up along the side of the hall, all of them with the same dead eyes, and no two of them quite looking the same direction. Also this picture does not give a proper sense of scale - these guys are pretty big. 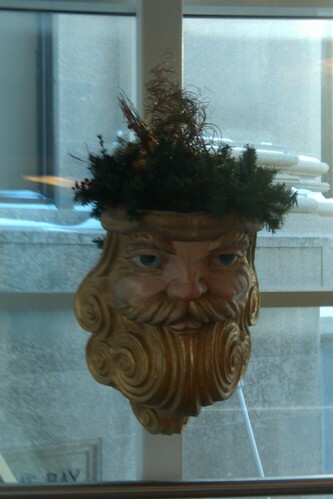 It must be Christmas because the mall just got a little creepier.